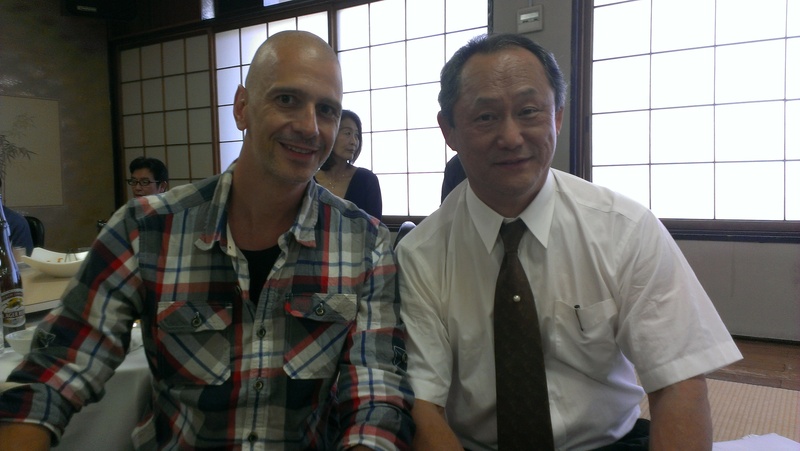 With Nagato sensei and my long time friend Peter Carlson from Sweden 11’Th of May 2014. It is my believe that if you are a good uke you are OK. Think about it if you can recieve without getting injured or killed then all is OK and you will be very difficult to fight. Most of us including my self have a tendency to focus on the tecnique we are supposed to execute more than we focus on the recieving end. I got som quite interesting eye openers this time in Japan wich I look forward to share with you here. At several practices with Nagato sensei may 2014 he mentioned that techniques can be done on a councious level, on a subconscious level and as what he calls Kami waza. This kami waza is shin gin budo the theme of 2014 as put out by soke. This kami waza level can be reached by having a relaxed confidence without any intention about winning (or loosing). Budo is not about winning or losing. It’s about survival. To reach the level of kami waza it is my own opinion necessary that we spend many years of serious training on the basics and do this with many repetitions and good form and are very conscious about it. There after you henka according to Uke and the total situation. Said in other words you go throuhg many years of Shu and Ha before you come to Ri. In the basic training process you should be conscious about deleting bad habits and weak points from your taijutsu and building strong roots. It is these roots that are built in to your nervous system and the cells of your body and becomes subconscious responses later on in your keiko and real fighting if you may find your self in such situation. Subscouncious techniques comes form inside, from build in codes in your nervous system. Kami waza is a level beyond the subconscious techniques. It is as if something from outside of yourself makes your movement and body response. Subconscious response is coming from inside and your body does the movement itself ignited by the nervous system. But kami waza is different. You need to be open to the believe that something greater takes over. 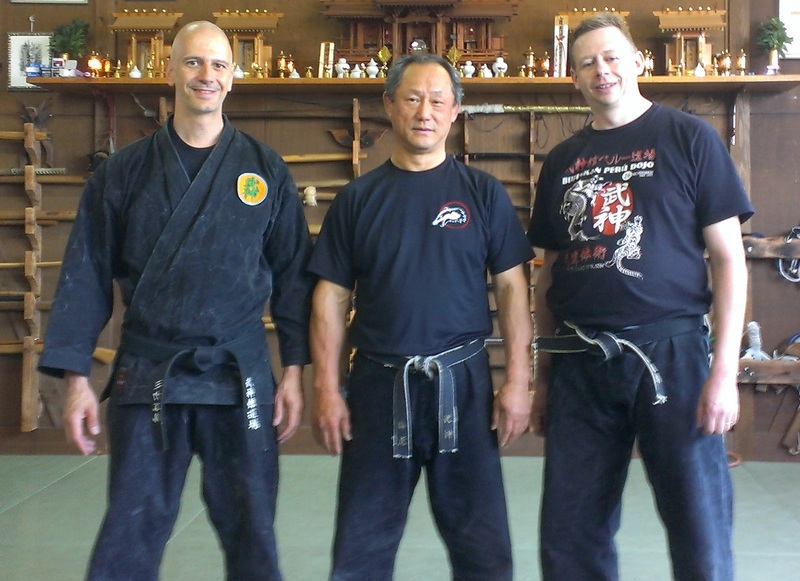 Saturday the 10’th of May Nagato sensei talked about the fact that it seems like the more time one spends in practicing the teachings of Bujinkan and sokes martial art the more he or she seems to be protected and avoid being in dangerous situations. I can best describe my own recent experience with this subject by telling you about my feeling of being uke for Nagato sensei at many of his sessions at this trip. I think that we shidoshi all have some feeling of what shin gin budo might be. We have all experiences of doing taijutsu that we did not think about when teaching. I think rarely for many of us is this kami waza, but probably most times subconscious responses that comes up because of years of training. I think for most of us kami waza is something we experience when our life or body is in danger. When we find that our body moved or was moved out of the way of some really dangerous situation. This might be related to sakki jutsu or shinnen jutsu. I might be wrong about this but it is my humble feeling right now. Anyway being uke for Nagato sensei has been different this time. Only one time has he asked me to start the class by showing a technique. All the other times he has just used me to show some thing he liked to transmit. At some classes it has been sword at others like today he went through kamae and kihon happo which might be a subject for another article as this also was a once in a lifetime experience with Nagato sensei. I have never heard of or seen him do this before. We only did his version of each of the Kosshi kihon sanpo and torite kihon gata go ho and we went through all of them. Very precise, no henka. All were supposed to copy sensei. And he went way over time as he did in all the other classes as well except one class. Enjoing good times and kuden with Nagato sensei during Shidoshi-Kai party in Noda 11’Th of May 2014. Back to the original subject. After many experiences of being uke for Nagato sensei over the years as many of you know, you build some kind of ability to follow and it is like your body knows what to expect. Maybe you do not know consciously but your subconsciousnes takes over and make your body respond and recieve. In other words you build a realationship to your teacher and you as Tori and Uke work better together. This time it was different. There was this specific training where sensei more times just called me out and said attack. During his demonstration of his taijutsu I felt that my body sometimes was moved faster than it would do in a real fight. Actually faster than I thought was possible. I felt that my body survived locks, throws and blows that would normally break my bones or my joints. But something moved my body. My body took ukemi that it never did before and from situations where I thought now I break my elbow or dislocate an ankle or now I brake my neck. But no injuries. Maybe my body did not have the perception and ukemi ability to do this before, but I could never have done this if I did it myself. I would have broken my neck if I tried to do this myself. It actually felt most like the sakki test. It was like something from outside worked through me or guided my body in super speeds and transcended the physical laws. That was the feeling. At the same time I know that sensei was holding back. He was only using some percentage of his true power which would have injured me for sure if he have not hold back. Many times he stopped and gave my body time to rebalance before his nxt move. If not I would have had no chance. All this has made me think that maybe it is easier to grasp the theme of this year by focusing on being uke. After all it is more important to be a good uke and respond naturally without thought and hesitation, that be a good tori in a real fight. Yet most of us focus most on the tori part in the dojo including myself. But if you think about it, if you can receive without being killed or injuried you would survive and be OK. That is one of the messages from the story about Takamatsu senseis fight with the big Chinese fighter that was more that twise as heavy as Takamatsu sensei. As I remember the story, he challenged Takamatsu sensei 3 times. Third time Takamatsu sensei accepted thinking that it would be bad for the kami to refuse. By focusing on not being hit Takamatsu sensei finally could end the fight when his opponent was exhausted. As I remember it Toda sensei ended the fight just when Takamatsu was about to attack. And the two fighters became buyu. Sensei said before class in his own dojo Saturday the 10’Th of May 2014 that training in the dojo is your own responsability. If you end up being injured, do not complain. If you die during training, do not complain. This is Budo. I still know that I could have done nothing and that I would have ended up with injuries if Nagato sensei had not adjusted to my taijutsu and if it was’nt for many years of conscious kihon training in the dojo and of many years of being uke for Sveneric. So conclusion is that I will still train myself in the dojo by being conscious about my kihon training. But a theme for me at this trip in actually all trainings has been to be a good and natural uke for my sensei and trainingpartner and this has given me some good lessons.